Gamma Density – Geotek Ltd. The density (ρ) of a material is a measure of how tightly the matter within it is packed together and is given by the ratio of its mass (m) to its volume (V). Its SI units are kilograms per cubic metre (kg/m3). It is also sometimes given in the cgs units of grams per cubic centimetre (g/cc). Bulk density is a property of powders, granular and multi-phase materials, especially used in reference to soils and sediments. It is defined as the mass of any particles of the material divided by the total volume they occupy. The total volume includes particle volume, inter-particle void volume and pore volume. The bulk density of soils and sediments depends greatly on their mineral make up and the degree of compaction and as a result bulk density can change as a result of handling. Bulk density is usually measured using gravimetric and volumetric techniques so to differentiate the measurements made using the MSCL the term “gamma density” is used. A gamma ray source and detector are mounted across the core on a sensor stand that aligns them with the centre of the core. A narrow beam of collimated gamma rays is emitted from a 137-Caesium source with energies principally at 0.662 MeV. These photons pass through the core and are detected on the other side. At this energy level the primary mechanism for the attenuation of gamma rays is by Compton scattering. The incident photons are scattered by the electrons in the core with a partial energy loss. The attenuation, therefore, is directly related to the number of electrons in the gamma ray beam (core thickness and electron density). By measuring the number of transmitted gamma photons that pass through the core unattenuated the density of the core material can be determined. To differentiate between scattered and transmitted photons the gamma detector system only counts those photons that have the same principal energy of the source. To do this a counting window is set which spans the region of interest around 0.662 MeV. The simplest and most reliable method for the calibration and calculation of gamma density is to use an empirical approach which has been shown to provide excellent results. The technique relies on calibrating the system using both the liner in which the core is contained and the fluid which the sediment contains. 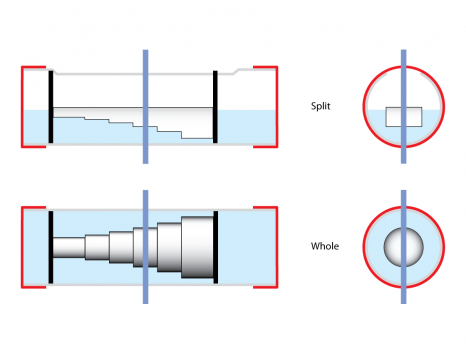 For example, when using a whole core with water saturated sediments, a calibration section should be made which consists of a cylindrical piece of aluminium of varying thickness surrounded completely by water in a sealed liner. For a dry core, the calibration should be done with aluminium surrounded by air. Porosity can be calculated directly from gamma density if the sediment can be assumed to be a two-phase, saturated system with an average mineral grain density and and average fluid density. Gamma density data can provide a precise and high-resolution record of bulk density, an important value in itself, and an indicator of lithology and porosity changes. Gamma density records are frequently used for core to core correlation as changes in depositional history can cause sharp changes in density. Another important application of density is the calculation of acoustic impedance and construction of synthetic seismograms.